The linked hayfields of the 324-acre Hollow Fields reserve offer the Berkshires’ best view of Yokun Ridge, and abundant bobolinks nesting in the grasslands. The mown path through the fields connects to trails and wood roads in adjoining forestland, including a 45-acre parcel owned by the Richmond Conservation Commission. 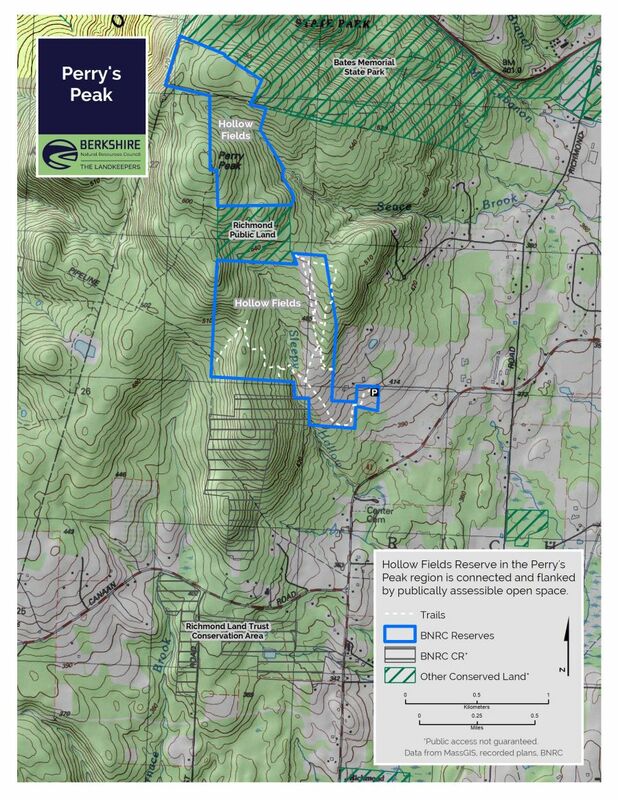 Notes: BNRC has secured access only to the trails that appear on our map. 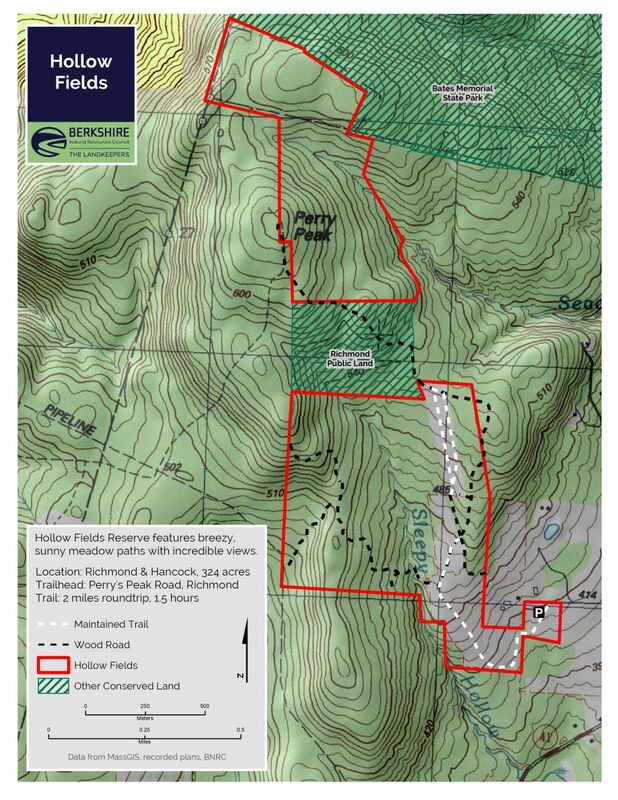 No access to Perry’s Peak is available from our property; no access to the Taconic Skyline Trail is available beyond our boundaries. From Great Barrington: Take Route 41 north into Richmond. After passing Route 295, Perry’s Peak Road will be the next left approximately one mile down the road. On Perry Peak Road, find the parking at the second red barn on the left, with a BNRC sign by the road. Please do not park directly on Perry’s Peak Road in any season. From Pittsfield: Get on West Housatonic Street (Route 20) heading west. Turn left onto Route 41 just before Hancock Shaker Village. After 2.5 miles turn right onto Perry’s Peak Road. Parking is signed, second red barn on the left. Please do not park directly on Perry’s Peak Road in any season. From Lenox: Take Route 183 west towards Tanglewood. Just passed Tanglewood, turn right onto Richmond Mountain Road. Richmond Mountain Road becomes Lenox Road. Continue on Lenox Road through a few intersections and 3 miles. When you get to Route 41, turn right. After passing Route 295, Perry’s Peak Road will be the next left approximately one mile down the road. On Perry’s Peak Road, find the parking at the second red barn on the left, with a BNRC sign by the road. Please do not park directly on Perry’s Peak Road in any season. The mowed path runs downhill from the barn. Without too much effort, a walk up through some of the 40 acres of fields provides a profile view of Yokun Ridge and a bench to enjoy it from. Higher up, there is a view of the crenelated hills of South Berkshire. After the summer haying season, the mown path can sometimes be difficult to make out. Trail blazes on the bluebird birdhouses mark the trail direction. From the trailhead to the most distant point of the uppermost meadow is about two miles. A round-trip walk takes about two hours. More ambitious hikers can explore the wood roads that branch off from the mown path and head towards Perry’s Peak. From its settlement in 1765, Richmond’s forests have come and gone as the land was cleared for agriculture, abandoned until the trees regrew, cleared for charcoal to feed the iron industry, abandoned, and so on. The reserve comprises sprawling fields with outstanding views to the east and south, taking in the entire length of Yokun Ridge. Thanks to the generosity of Ron and Judith Shaw, the hayfields to the south and west of this point are conserved and open to the public forever. 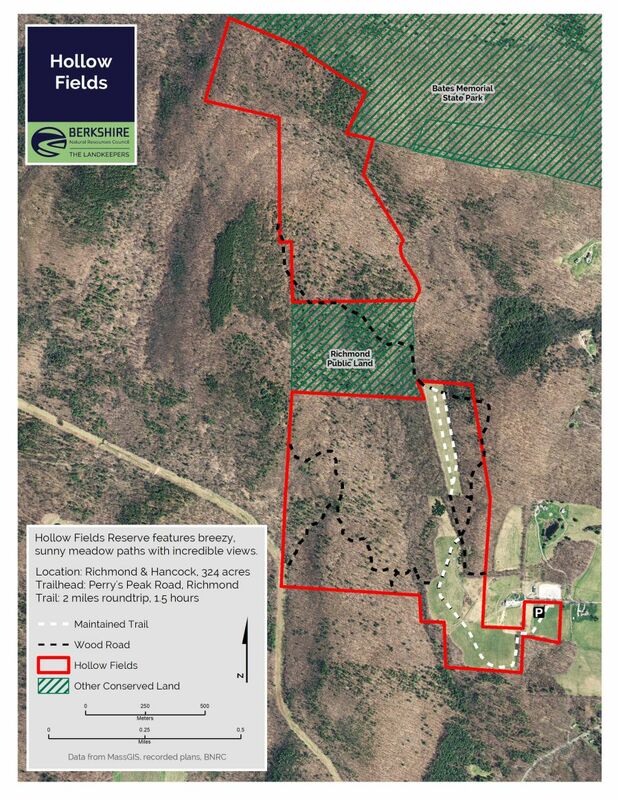 With the Richmond Land Trust, BNRC makes this reserve available for passive, nonmotorized recreation. Forty-five acres of Town land are adjacent to the property and are open to the public as well. The most northern meadow abuts a wooded parcel that was originally donated to the town of Richmond by the Miller family, former owners of The Berkshire Eagle. Members of the family helped found the Berkshire Natural Resources Council in 1967. The fields host a variety of important and declining wildlife, including bobolinks and Savannah sparrows, which nest only in grassland, and milkweed, which attract monarch butterflies. The scrub and young forest offer breeding sites for indigo bunting and eastern towhee. The mature forest of mainly hardwoods is habitat for the scarlet tanager and the hermit thrush. Blueberries can be found in higher exposed areas. From the settlement of Richmond in 1765, its forests have come and gone as land was cleared first for agriculture, then abandoned, and then cleared for charcoal to fuel the long-since stilled Richmond Iron Works. The stream that slices through the reserve to the west of the hayfields is Sleepy Hollow Brook. It crosses under Route 41 near Richmond’s Northwest Cemetery.